With Halloween around the corner I find myself strategizing. Sugar will be ever-present; at school, at parties, on end-caps at the grocery store. For a family that doesn’t do much sugar, artificial ingredients, and can’t have gluten or dairy, Halloween can be more challenging than fun. How do you handle the sugar of season with your kiddos? Do you buy candy back for a nickel a piece? 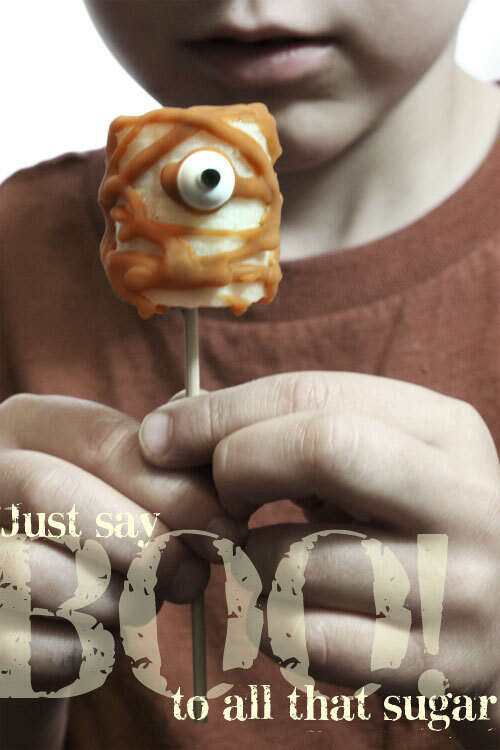 Do you subtly raid trick-or-treat bags as you make your way around the neighborhood? Well, while you think of the advice you’re going to give me, I will share this week’s recipe. 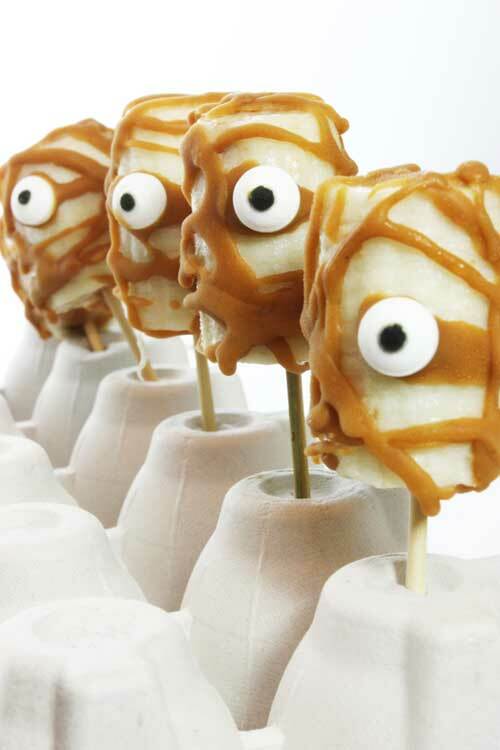 The inspiration for these Banana Mummies and “Things” comes from a recent post over at Fork and Beans. This has got to be one of the cutest posts I’ve seen in a long time. Cara does a fantastic job showing us, step-by-step, how to make and display these frozen banana pops—so I won’t get into it, but I will share that rice is involved. Anyway, I LOVED this idea and ran with it. But, since we can’t do white chocolate or even dairy-free chocolate at the moment, I needed an alternative candy coating. What I came up with may not be Godiva, but it works and we gobbled them all up as good goblins would. An egg carton turned upside down with little holes poked in the bottom made a good stand as we worked on them. See Cara’s post for her rice idea (toward the end). Cocoa Butter: If your local natural food store doesn’t carry food grade cocoa butter, here are some chips that look fantastic (just pure cocoa butter). Whatever brand you buy, ensure that it’s food grade. Candy Eyes: These candy eyes were purchased at Michaels. You can find them in the cake decorating aisle. They contain some artificial colors and the usual yucky stuff. You can remove them prior to eating—or choose not to sweat it. Up to you. Lexie, these are adorable! My Kindergarteners would LOVE these!!! omg Lex! Those are absolutely the cutest idea I've seen for Halloween! Will def make these. Thanks so much!!! Oh my goodness! These are the most adorable things EVER!! Once again…you amaze me with your creativity. And such a fun idea! I like ideas that are healthier but still fun. I like treats that are healthier than most. And, frozen bananas can still be a terrific summer time treat, too. Those are just so cute!! Love 'em! 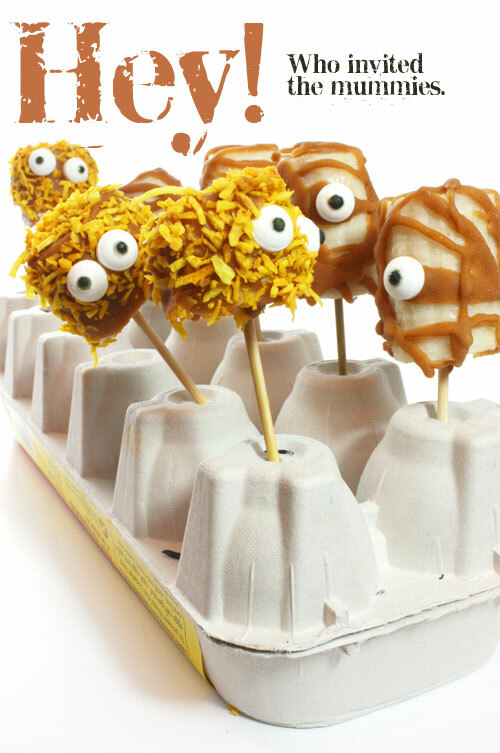 My kids will love making these! Thanks for such an insanely adorable idea! The kiddo thinks these look amazing. And, I think the Fork and Beans blog is amazing. How had I not stumbled on that before. Thanks for introducing her to me – and for creating such a cute Halloween treat. I would love for you to add this to my Halloween Traditions link up! just saw this on cookeatpaleo, in a post of 10 easy Halloween treats, adorable and even though I see that this post was originally posted in 2011, I haven’t seen anything like this before, and even more importantly. appreciate that it’s been left unsweetened, there’s already enough sugar during Halloween anyway, so thank you for sharing this recipe! Hi Sabrina, I hope you and your little friends have fun with this one. It can be so hard at Halloween, but with a little creativity … well, everyone can have a treat 🙂 Thanks for dropping by. Come soon!